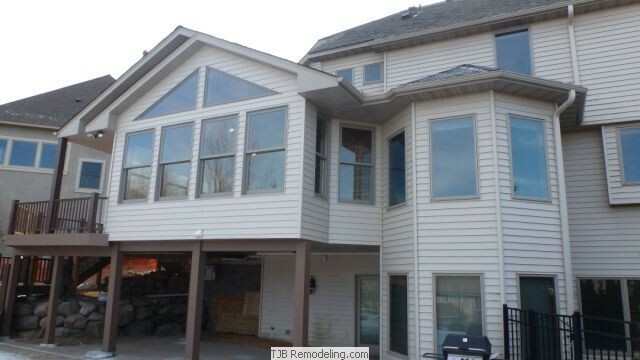 Parade of Homes Remodelors Showcase 2012. 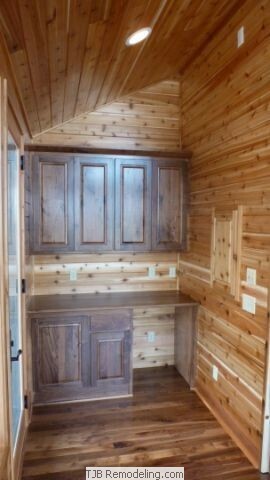 14′ X 20′ four season porch and deck. 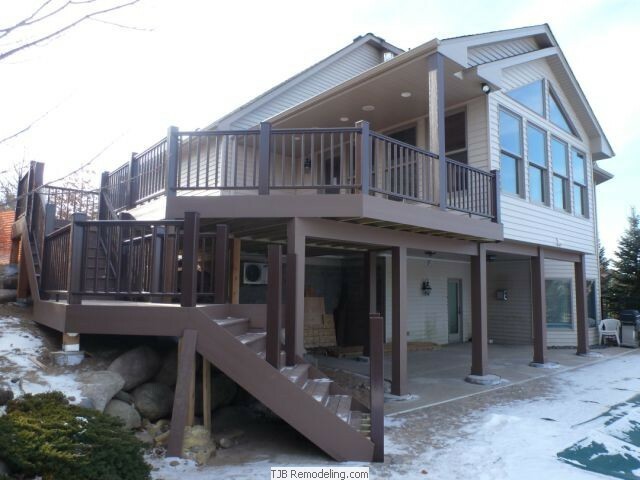 This new space will be the envy of all looking for a new four-season porch and deck. 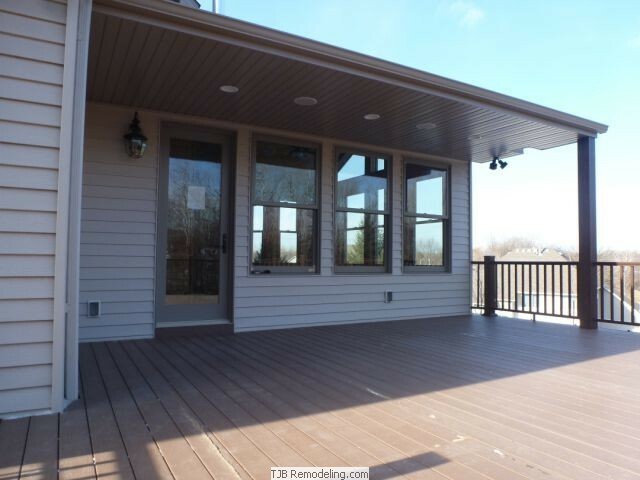 This enormous 313 square-foot porch is finished with walnut hardwood floors and cabinets. Walls and ceiling completely surround you in cedar tongue-and-groove, boasts 14-foot ceilings, loads of natural light with Marvin windows, and the massive floor-to-ceiling six-foot stone fireplace sets off this retreat. A tranquil 400 square-foot, maintenance-free deck, finished with matching railings. 147 square feet of this deck is covered to escape the sun when needed. Many more details, too many to list. With ten thousand lakes to choose from, Minnesota could be called the land of relaxation. Nowhere is it easier to lounge lakeside or satisfy a little R and R than with a weekend getaway up North. 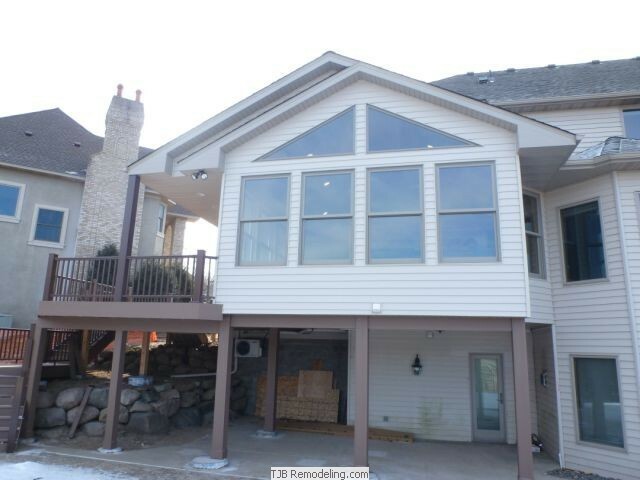 For Jim and JoEllen, however, the joy of vacationing in Minnesota’s northern landscape inspired a lot more than just relaxation; it inspired a backyard remodel of their Twin Cities home! The couple worked with TJB Remodeling to transform their backyard deck and detached gazebo into a cozy four-season porch and maintenance-free deck. 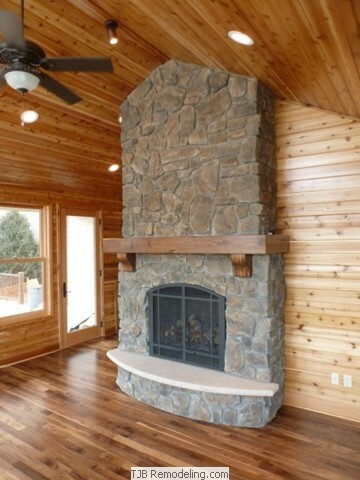 The design incorporated the down-home warmth of a cozy cabin and, according to Jim, "the feel of the north woods." 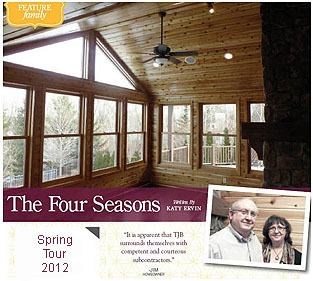 DFP Planning & Design, the design firm that designed Jim and JoEllen’s home, recommended TJB Remodeling for the remodel. DFP drew up the blueprint for the project and then Jason Budzynski of TJB Remodeling "offered to modify the concept to reach an agreeable plan that worked within our budget and overall plans for the new space," Jim explained. 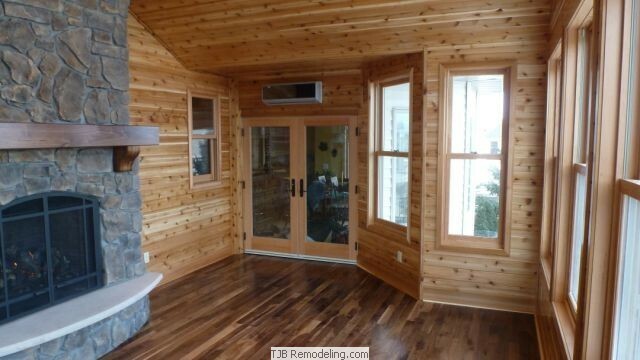 The couple was immediately impressed with Jason’s knowledge of remodeling as well as construction techniques, materials, and new technology. "He also demonstrated creativity, enthusiasm, and respect and accommodation to our needs," Jim said. 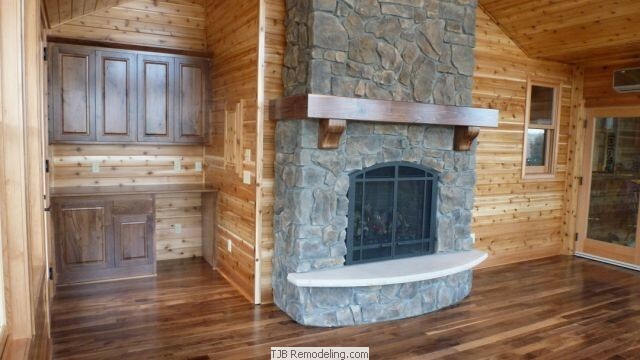 He was pleased with the designer at TJB and all of their subcontractors. "It is apparent that TJB surrounds themselves with competent and courteous subcontractors," Jim added. 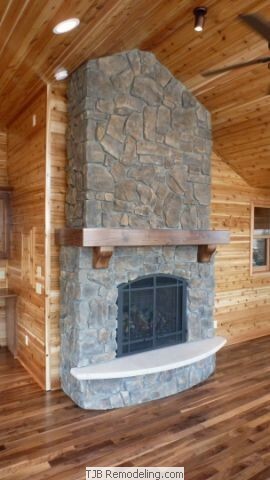 TJB Homes finished the project in eight weeks, unveiling a beautifully established room made from a variety of natural woods and rustic elements like a stone fireplace and amplesized windows. Previously a detached gazebo, the room is now a four-season porch that will serve as a unique getaway and "extension of our home," JoEllen said. The deck overlooks the couple’s landscaped property and a portion of the deck is covered, allowing the family to relax outside no matter what the weather. A vaulted ceiling maximizes the natural lighting coming in and, because their home is situated on top of a hill, the couple can also enjoy spectacular sunset views. Probably the most relaxing element of the new space, however, is the maintenance-free Azek decking and railing, and the maintenance- free siding that TJB Remodeling installed. 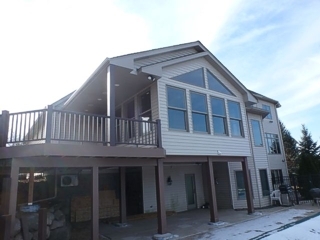 No longer will Jim and JoEllen have to worry about the upkeep of staining the deck or the outside of the porch. 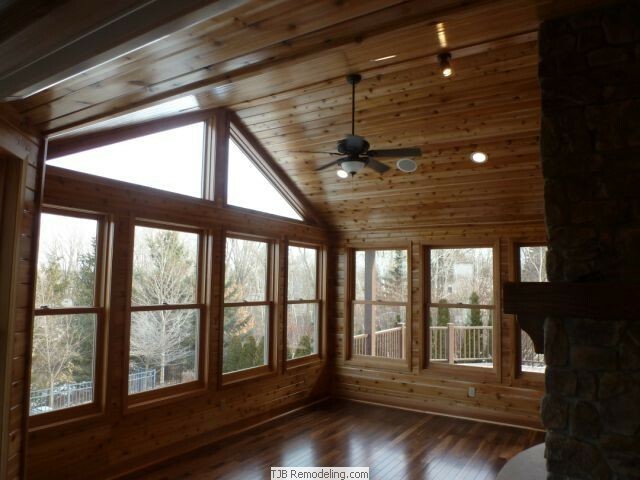 Now, the family can truly relax year-round in a room that’s fit for The Four Seasons.